The Epic Glove is an excellent all around climbing glove for cold weather conditions when encountering wet rain or snow and when doing vigorous exercise while skiing, snowshoeing, mountaineering and other outdoor activities that require manual dexterity, such as technical climbing while using ice tools, or ice axes, mixed rock and ice climbing, dog sledding, skiing, and setting up and taking down camp. Background: When preparing for an excursion in the outdoors, many people overlook one of the most critical pieces of clothing for backcountry and climbing activities, protection for your hands. In extreme cold conditions, the penalty could be as severe as frostbite to the point of losing fingers. Since most people are used to wearing shoes or other footwear, they usually give some passing thought to their feet. Too often, people settle for “any old glove or mitten”, without giving much thought to the functionality of the handwear. The requirements are much more extensive in many ways than for other clothing except for footwear and head wear. 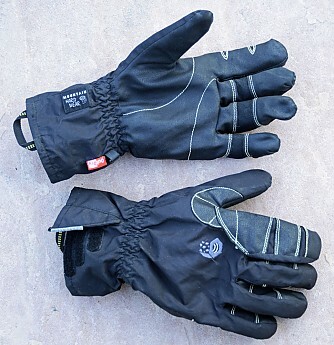 Just as with footwear, gloves and mittens must be suited to the task at hand – a gardening glove, driver’s glove, or a roper’s glove is not suited for climbing and hiking, and a climbing glove is not suited for blacksmithing. Durable enough to survive the rough handling that inevitably happens during an expedition. One requirement for trips where I will be doing a lot of cooking, handling hot pots, or having a campfire is that they have to have high heat resistance – they should not melt, catch fire, or soak up spilled white gas. This may require a separate set of cooking gloves, of course. Over the years, I have used a wide variety of hand coverings from knitted gloves to leather and synthetic gloves with thin wicking liners, “lobster” mitts, “fingerless” gloves (and glove-mitts with a foldback cover for the fingertips), and gloves which were completely waterproof. 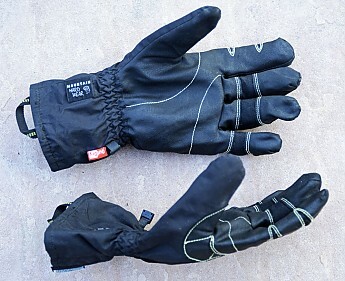 Gloves which have all the fingers in separate pockets generally do not provide as much warmth as mittens or “lobster” mitts, but provide much more dexterity. Completely waterproof gloves tend to pool water inside, while using wicking liners inside completely waterproof (or even waterproof/breathable) outer shells tend to produce soggy liners during vigorous activities (with the solution being carrying multiple liners and swapping them often). So it was with great curiosity that I spotted the new line of OutDry handwear in Mountain Hardwear’s employee store during a break in the Annual Meeting of the American Alpine Club a year or so ago, hosted in the meeting rooms of Mountain Hardwear’s company headquarters in Richmond, California. When they allowed attendees a short window of opportunity to buy gear at bargain prices, I grabbed a pair of the Epic gloves and a pair of their Masherbrum Mitts. I would have bought more items, except that my finances would not allow that (and they did have a limit on what we could get). Besides, my Trango 3.1 tent (bought at regular retail many years ago) is still in excellent shape. Over the years, I have found that their gear is well-made, though expensive, ranking among my 10 or so top gear companies when I need gear. Details: The right-hand glove had two 4.5 inch long information strips, printed on both sides describing the care and materials in 7 languages (English, French, German, Spanish, Portuguese, Russian, Italian), of which I can read (but barely speak) 5 and hobble through the other 2. The long tags are a nuisance and not very durable. My solution was to cut them out and save them in a safe place for reference. The gloves were made in Sri Lanka. I was a bit surprised to read the note to “do not wash, do not iron, do not bleach, do not dry clean”, but allowing “hand wipe with damp cloth, line dry in shade”. Since I have found over the years that gloves can get quite smelly inside (especially waterproof and insulated gloves and mitts), there does need to be a way to clean them. 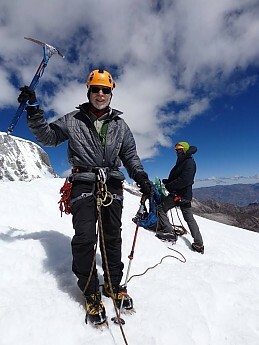 The odor buildup over the month in the Andes was less than the majority of other climbing and ski gloves I have. With many other gloves, liners can be removed for cleaning, or the gloves can be turned inside out for washing. The shell is listed as 100% polyester, with the “high-grip” palm being polyurethane and nylon. So just how are you supposed to dry them during a winter or high altitude trip? If you hang them on a line, even in your tent, they will freeze. I did dry them a couple times by taking them into the sleeping bag with me, though that is uncomfortable. For the odor, the best I came up with was to turn them inside out and use an odor eliminator powder or spray on the liner after returning home. 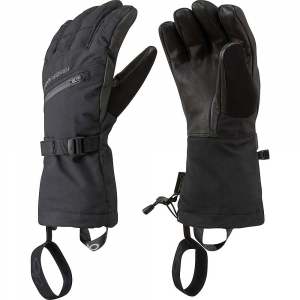 The pull-on loop at the cuff of each glove makes it very easy to get them on and off. The gloves do lack a keeper cord, which raises the risk of losing one if you take it off in blowing wind or in an awkward location. You can stuff it in a parka pocket (if you are careful to get it all the way in). A better solution is to tie a long cord to both gloves in the pair and loop it around your neck (like your mommie used to do when you were a little kid playing in the snow). 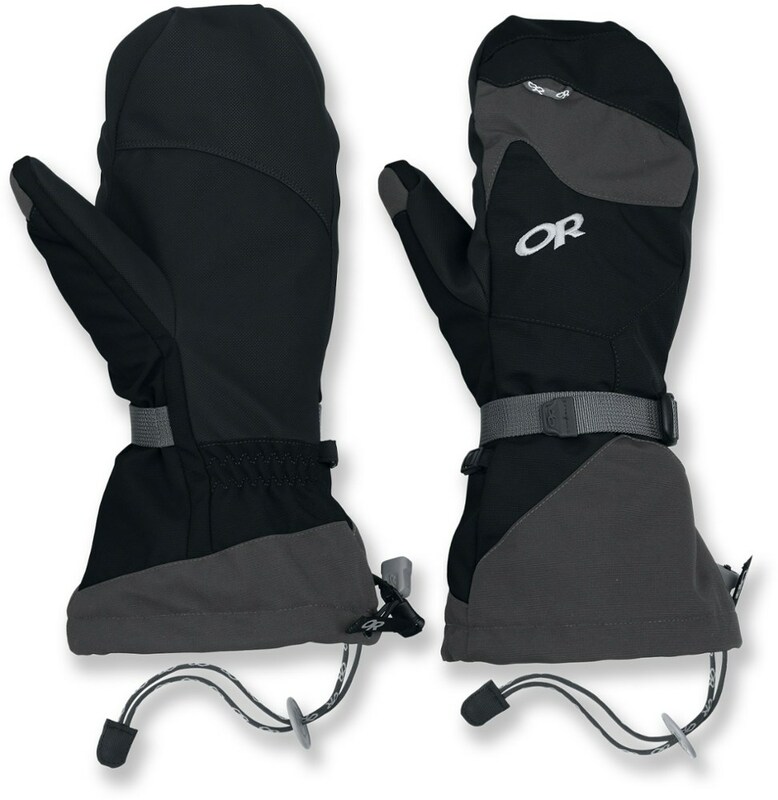 The OutDry construction (a polyurethane bladder sealed to the inner side of the polyester shell) means that the gloves are designed to be waterproof from outside and wicking (the brushed polyester/nylon lining) for sweat inside. The “PreCurve articulated” shape is intended to be flexible for climbing using ice tools or ski poles. The wrist closure is a gore with a Velcro closure, which I found works quite well for keeping snow out, in combination with the elastic at the heel of the hand. Knowing that I would often be using the gloves in very cold weather, I got the men’s extra-large to allow room for thin wicking poly liners. This proved to be a wise choice, and was determined by trying on a range of sizes in the shop. Most of my insulated gloves and mittens are men’s large (Black Diamond, OR, Cloudveil). 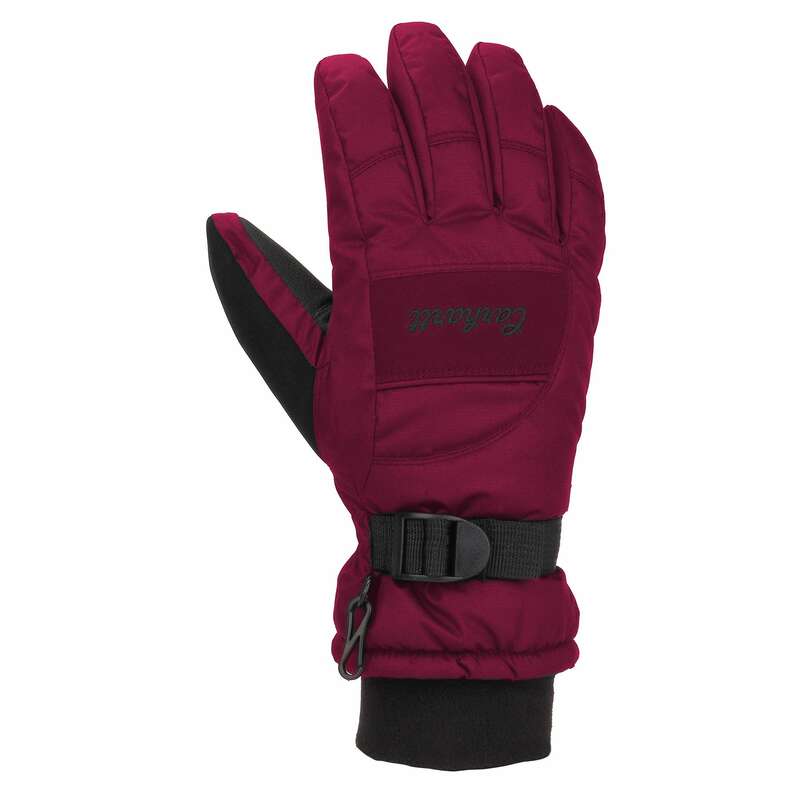 Details of testing: Since a major part of my outdoor activity is in winter or at high altitude, and mostly involves vigorous activity (climbing, skiing, snowshoeing, and more recently dog sledding) I am always looking for the perfect glove. I have concluded that this search has to be modified to “perfect glove for the conditions and intended usage”. I did very little preliminary “dry land” testing, just used the Epic gloves in real situations in the field (I taught a winter camping course in-snow session a week after buying them). I normally do some deliberate “abusive” tests of new gear before heading out into the field, where a failure could be critical. Over the next 3 months, I used the gloves during both backcountry and “yoyo” skiing, ice climbing in the Sierra and Wasatch, mountaineering in the Cordillera Blanca (snow, glacier travel, and rock), and mushing a team of dogs for a week in the Alaskan bush (the accompanying photo above with ax in hand was clearing ice off the runners after a night of camping on a frozen stream). Usually, I have to take off my gloves to use my Nikon DSLR or my tiny P&S. However, I found that there is enough feel and dexterity with the Epic gloves to do virtually all the functions of the DSLR and the main ones on the P&S (the primary exception being those on the touch screen). One of the tests for grip was done on my balcony. It consisted of hooking one of my pairs of ice tools over the lattice over the balcony and doing sets of pull-ups (see photo). I did multiple reps of 10 pullups (leashless, of course), for a total of 30 with no slippage. For reference, standing on the deck of the balcony with my heels slightly raised has my arms fully stretched to hook the picks on the 2x6s. 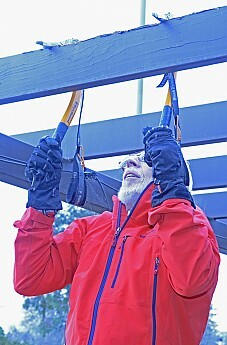 The photo above shows how the glove fits while grasping an ice tool with the little finger resting on the upper hook. You can see there that the little finger fits within the curve of the hook (click on the image to see a larger version, and then on the “see original” for the greatest magnification). I did one deliberate test of the waterproofness by holding my hands under a water faucet for about 15 minutes. In the field, my gloved hands were frequently in meltwater. The gloves proved to keep my hands completely dry, with the Velcro closure keeping all but a few drops out of the inside of the glove. Despite a lot of hard usage on rock and handling the packs and ice tools, the gloves show little wear. So the durability test is passed. Most of the time, I did not use liners, finding the insulation provided to be adequate during vigorous exercise in temperatures as low as -20°F (I did have plenty of layers on my torso plus warm boots). The “PreCurve” shape and articulated design worked well at allowing plenty of dexterity and circulation. There were times when standing around that I did add thin wicking liners, or switch to my heavy mittens (usually adding an expedition-weight down parka as well). But the Epic gloves proved surprisingly warm for the conditions, more than I had expected given the good feel and dexterity through the gloves. Conclusions: Overall I found that the Epic gloves worked very well and performed as advertised. I got condensation inside the gloves only rarely. Water from the outside stayed out, whether a stream, wet snow, or rain. 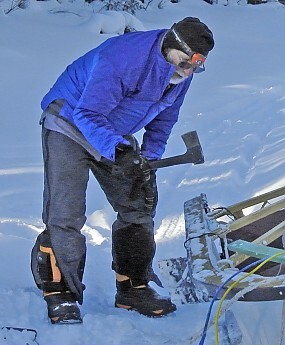 The grip and feel when handling ice tools or ski poles was very good. 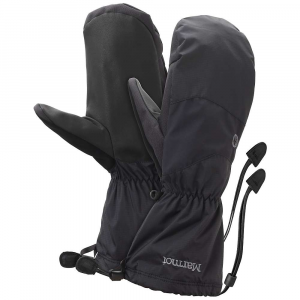 For climbing waterfall ice or mixed rock and ice, they do not have the padding that my Black Diamond Guide Gloves or my Cloudveil Ice Gloves have. But the Epic gloves come as close to “perfection” I have found for the conditions I used it. For other conditions, I can use one of my many pairs of mittens or insulated climbing or ski gloves. Great snowball gloves! Or slushy mild winter days in general. I got these gloves for sugaring (ie. collecting sap for maple syrup). At the beginning of the season we head out and repair and replace all the tubing that has had tree limbs and snow falling on it all winter. This involves slushy wet snow, hot water and rigid and flexible plastic tubing. Typical sugaring weather is days in the upper 30s nights in the teens. My typical leather gloves are usually soaked before long and wont grip the plastic pipe to stretch it into place. These gloves are comfortable with smooth inner seams all four fingers fit me perfectly, but the thumb runs a good half inch long. Maybe it's my thumbs. But if the thumb would fit me as well as the rest of the fingers that would improve dexterity. Now though I have enough dexterity for me to use nut drivers, a drill and grab connectors out of a bag. Plus I have to soak the rigid pipe in hot water to soften it to slide the fittings in. I can do all of that with this glove without taking it off all the time. My hands stay dry and when I need to grip the tubing they dont slip like other gloves. They are in very good condition after one season and I will update if any problems occur after the upcoming maple syrup season. I give you a +1 just for using these gloves to make maple syrup, MoZee. I hope this year's a good season for you. 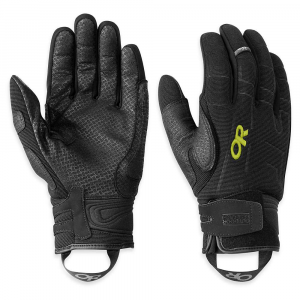 Looking for some gloves for the bro on his Baker and Rainer climbs. This helps! Not warm in temps under 20 deg F.
I need some gloves for when its wet and not especially cold. These are it. Though they are a bad choice for sitting still at temps near zero but they excel in the 20-40 degree range when it's wet. The waterproof breathable membrane is bonded to the exterior thereby preventing that wet outer layer that you see in Gore-tex gloves. They are tough and therefore sacrifice a little in the dexterity department but that's OK for my needs. Using them XC skiing they are ideal. When I am less active I slip a set of Lavawool liners inside the ample space inside and they are about right. These remind me of the modular jackets which have fleece liners which zip in and out. I just had to use my own liners since they are sold without. These are not the gloves to use on extreme cold or while holding cold metal tools all day. They are a nice hard shell that stops wind and water while providing a little insulation. Add your own liners and these work for all but the coldest weather. After 1 year of use they wore thin from abuse at the rope tow but still kept me dry. I had to remove them a lot to adjust the kid's skis and my hands got wet from the snow. The lining sticks to fingers making them hard to put back on with wet hands. I live in the Pacific Northwest and I get our year-round. I live in the Pacific Northwest and I get our year-round. It really does rain here, a lot, and the rains are often cold. Most waterproof gloves have design flaws. They may be made of waterproof materials but the seams aren't sealed and/or the waterproof layer is on the inside so that the outer glove gets sopping wet and this makes the hands cold. Since waterproof-breathable fabrics will all leak if the outer layer is wet then this makes the gloves not truly waterproof. But Mountain Hardwear with this Epic glove that uses their proprietary OutDry technology has put the waterproof-breathable layer on the outside of the glove and the seams are sealed. I've used mine during many days of wet snowshoeing, double-header soccer games in November, and just walking around town. My hands have never been wet. If it's cold enough I'll add a liner glove. The Epic is cut large enough to allow for this. Epic gloves are the thinnest and lightest of the OutDry line. There are 3 or 4 warmer and more heavy-duty models. I have a pair of the Guajillo, the next warmer model that I found a great deal on. I've worn them only once on a cold, windy, wet day of snowshoeing. They were great but too warm when exercising so I went back to the Epics. However, when we were sitting around during lunch the Guajillos were welcome. I'm a Professional Dog Walker in Portland, Oregon. I'm a Professional Dog Walker in Portland, Oregon. I bought these gloves because I need a reliable way to keep my hands warm and dry while I am out with dogs in the cold and wet Pacific Northwest winter, based on brand reputation and consumer reviews. Unfortunately, I've yet to have a pair last an entire winter. I have returned my second pair, and am awaiting the 3rd pair to arrive in the mail from Mt. Hardwear Warranty Department. The problem is that the cuff material is thin and NOT durable, causing the material and seams to rip, thus compromising the waterproof membrane. The problem seems to be caused by repetitive on and off of the gloves, and not from extreme wear and tear. I haven't done any overnighters in the mountains with these gloves in the winter, but have spent many outdoors with these gloves in wet and dry and snowy conditions. The gloves are pretty lightweight for the amount of protection they have provided. They come up above the wrist and have a good velcro strap to seal the wind/water out. The inside of the hand is made with a pretty good grippy material and does a pretty good job of grip when wet. My major complaint is that all of the glove fits nice with the exception of the fingers, they are a bit long for me, so I would recommend trying them on before purchase is possible. My last complaint is that after extended use in snow/rain/sleet, the due tend to gain some water weight but they didn't seem to get wet inside, so that is good. 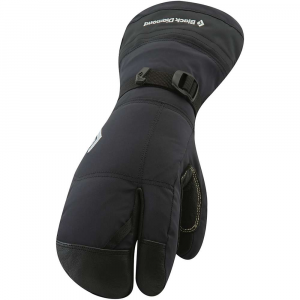 Overall a great medium duty (not alpine use) glove and would recommend to friends! 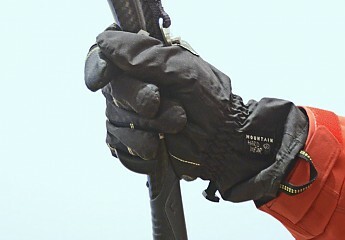 The Mountain Hardwear Men's Epic Gloves is not available from the stores we monitor. It was last seen November 19, 2015	at Sierra.